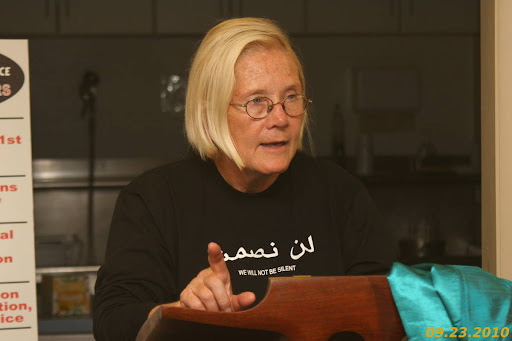 Ann Wright is a retired U.S. Army colonel and diplomat, and participated in the May 2010 flotilla to Gaza. She will be aboard the U.S. Boat to Gaza, which is organized by a US Campaign member organization, and is a US Campaign-endorsed initiative. This week, some 40 American citizens, including myself, will peacefully attempt to break Israel's illegal naval blockade of the Gaza Strip. The flotilla that we will be a part of is expected to consist of 10 boats carrying human rights advocates from around the world and humanitarian aid for the people of Gaza. The U.S. boat to Gaza, the Audacity of Hope, which I will be aboard, will be carrying letters of solidarity to Gazans, who live under siege in a virtual prison, cut off from the rest of the world and any semblance of a normal life. Our goal is to bring attention to their plight, and to bring about an end to Israel's illegal siege, which amounts to collective punishment of 1.7 million people. Although we will be sailing unarmed and have no intention of entering Israel or Israeli waters, the U.S. State Department issued an unusually specific and blunt travel advisory last week, warning Americans against traveling to Gaza. Without giving any details, State Department officials also suggested that Americans taking part in the flotilla might be violating U.S. law.